Absorbs and carriers intestinal waste out of the body. Acts as a natural infection fighter, helps to prevent tooth decay, and neutralizes acids and poisons within the body. Naturally detoxifies the urinary tract and is recommended for bone loss. Traditionally used to treat the female reproductive tract to reduce issues associated with bladder spasms, cramping pain, and heavy bleeding during menopause. It has been found to lower high blood pressure and treat kidney stones. Reduces inflammation of the intestinal and respiratory tracts. It’s a powerful antioxidant and aids in the dissolving of tumors. It’s effective in cleansing the Lymph System and is a strong herb for cleansing the kidneys. Cleans deep into the muscles and tissue walls. This plant is resistant to viruses and fungi. It is considered to be an herb of longevity. It’s used to treat poor blood circulation, mental confusion, and memory loss. It increases mental alertness, reduces blood cell clumping and strengthens the vascular system by improving blood circulation. The antioxidant properties found in the Hibiscus Flower helps slow down the growth of any precancerous cells that may be present in the body. It’s used as a tea to lower body temperature, treat high blood pressure, fight common cold, and reduce constipation. Helps to prevent damage & repair damage to the liver. It’s used to decongest the liver and clears obstructions from the spleen and liver. Protects and rejuvenates the liver. Protects the body against chemical toxins. Rich in anti-oxidant properties that aid in keeping the blood vascular system clean. 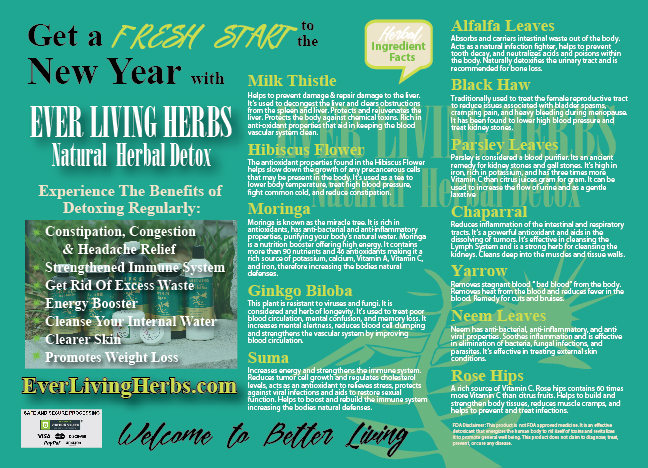 Moringa is known as the miracle tree. It is rich in antioxidants, has anti-bacterial and anti-inflammatory properties, purifying your body’s natural water. Moringa is a nutrition booster offering high energy. It contains more than 90 nutrients and 46 antioxidants making it a rich source of potassium, calcium, Vitamin A, Vitamin C, and iron, therefore increasing the bodies natural defenses. Neem has anti-bacterial, anti-inflammatory, and antiviral properties. 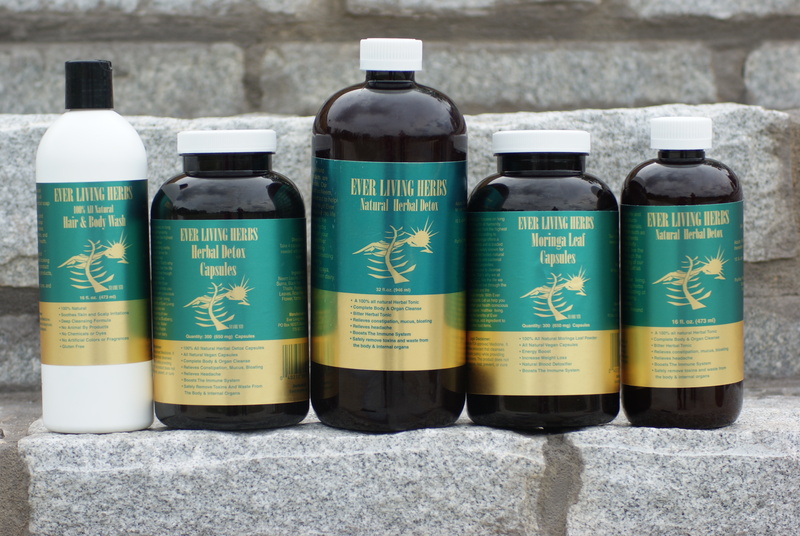 Soothes inflammation and is effective in elimination of bacteria, fungal infections, and parasites. It’s effective in treating external skin conditions. A rich source of Vitamin C. Rose hips contains 60 times more Vitamin C than citrus fruits. Helps to build and strengthen body tissues, reduces muscle cramps, and helps to prevent and treat infections. Increases energy and strengthens the immune system. Reduces tumor cell growth and regulates cholesterol levels, acts as an antioxidant to relieves stress, protects against viral infections and aids to restore sexual function. Helps to boost and rebuild the immune system increasing the bodies natural defenses. Removes stagnant blood “ bad blood” from the body. Removes heat from the blood and reduces fever in the blood. Remedy for cuts and bruises.